Seated in the backseat of Pedro’s pickup truck, I grasp the front-seat headrests to combat the bumpy roads and Pedro’s driving-style which often includes his hands leaving the wheel to include animated gestures in the stories he tells or to answer the incessant ringing of his cell-phone. His finger points out the direction of the passenger window, and he suddenly hits the brakes to bring the truck to a stop. My knuckles whiten as I brace myself and hope that my body will also come to a complete stop, preferably at the same time as the truck. It does. I make a mental note to remember to fasten my seat-belt. Although the stop is unscheduled and is unlikely to make any list of must-see sites, the roadside attraction we happen upon in the rural Chinandega region of Nicaragua is indeed a beautiful sight. 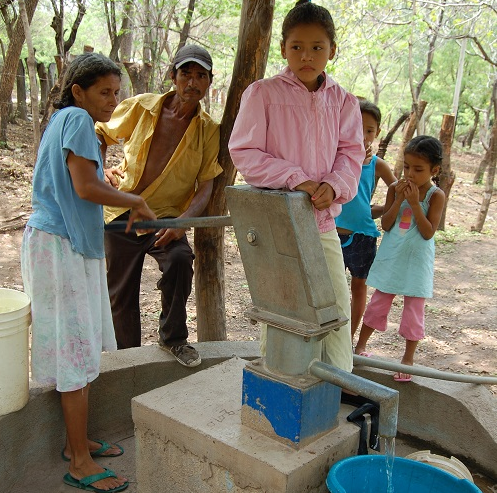 A four-post, corrugated roof structure shelters a hand-pump community water well — a community water well built by Change for Children back in 2006. 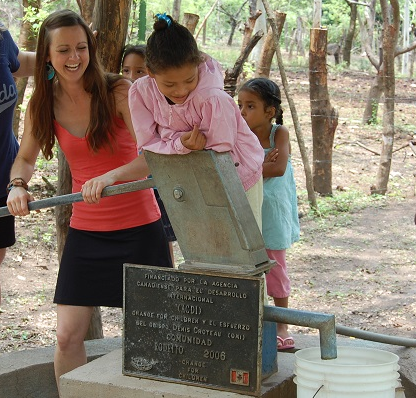 We visit with Herminio and his family as they collect water in buckets to carry the short distance home. Although most new wells drilled as part of the project now include a pump of some kind, a holding tank, and piping to gravity-feed water to homes, this installation represents a community well designed simply to bring clean water within reach. Community members continue to collect water in buckets, but the water source is located centrally and conveniently for all and represents a vast improvement over what it replaced in 2006 — too-shallow wells dug by hand and contaminated with sulfur and arsenic. And although installations have become slightly more sophisticated in the short 12 years since this well was drilled, it continues to produce clean water just the same. It continues to endure. I give the pump handle a try for myself and as water surges out the spout, I don’t even try to hide the smile that spreads across my face. The kids laugh along with me, but I am certain they must question this activity as a source of amusement for me. Or, at the very least, think it a little nutty. For them, this is routine. What represents a routine for these kids, and probably, at times, a dreaded chore (not to mention a source of life and health), to me is also a reminder that lasting change is possible. Endurance. So, perhaps my smile is not so much amusement as it is happiness. Confidence. Commitment. I bring it with me back into the truck. I think how great it is that, because of one well, this is the only water these kids have ever known. Clean water. I think of the potential. I smile. And then, I buckle up.